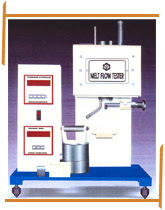 This instrument measures the rate of extrusion of Molten resins through a die of specified length and diameter under prescribed conditions of temperature, load, piston position. Instrument with following accessories will be suppliedDigital stop watch, Temp. Controller ( PID ), Piston, Orifice remove,Barrel Cleaner, Orifice Cleaner,Scoop, combined weight of 2.16 Kgs.. and 5.0 Kgs. 2. Resolution : 0.10°C, Accuracy : + 0.20°CTimer 0-99.9 min.